Games Offered: NL, PL and Limit Texas Hold'em, Omaha and Omaha Hi/lo. Deposit Options: Credit Cards, Western Union, Money Gram, and eChecks (on a limited basis). Sign up at Cake and receive a 110% match sign up bonus up to $600. They offer a great loyalty program and experience good site traffic. Sign up at Cake and receive a 110% match sign up bonus up to $600. 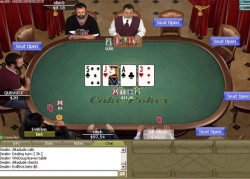 Established in 2005, Cake Poker has become a good destination for USA Internet Poker players. Running on the Cake Poker Network, they offer a great loyalty program and experience good site traffic. Their loyalty program consists of Gold Cards and Gold Chips where you earn cash, tournament entries and merchandise. See below for the full Cake Poker Review. Cake Poker offers Fixed, Pot and No Limit Texas Hold'em, Omaha and Omaha Hi/Lo. NL Texas Hold'em is most the popular game with action found up to $50/$100 on a regular basis. Pot Limit Omaha is the next most popular game with action up to $5/$10 easy to find. 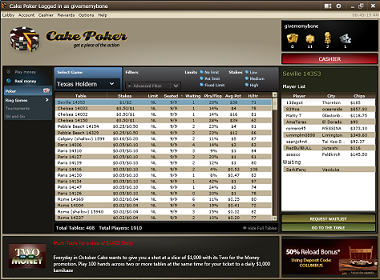 Cake Poker also offers multi and single table tournaments. Single table tournaments are offered heads up, 6 seated and 10 seated in standard blinds, turbo (6 mins) and ultra turbo (2 mins) formats. Cake Poker guarantees $5,000,000 in monthly prizes with the largest being a $25,000 guaranteed. An interesting tournament offered at Cake is the 10 seated Double Up Tournaments where the top 5 finishers are awarded twice their buy-in amount - hence the Double Up name. The Double Up Tournaments are a great money management tool for tournament players. Cake Poker offers a nice variety of USA deposit options. Deposit at Cake Poker with Credit Cards, Western Union and Money Gram. They also use to offer eChecks, but this deposit method has been unavailable as of late. Withdraws are processed by check. When we have requested checks they have arrived in about 10 business days. Being the flagship of the Cake Poker Network site traffic is above average. Ring games can be found up to $50/$100 for NL Hold'em. Sit'n Go Tournaments can be found up to the $200 level buy-in. During off peak times (after 11pm est) tournaments can be tough to find at higher stakes, but ring games still have at least a few tables going. The only method to reach the service staff is through e-mail. Cake states you will always have a response within 20 minutes of your request and they do a good job fulfilling that promise. During our review the longest we waited was 35 minutes for a response. We would like see a phone number to call, but at least the e-mail responses are fast. It is very common to find some weak competition at Cake Poker. Because the network also host USA Internet sites that offer sportsbooks and casinos, many players have migrated from the sportsbook. You will find players willing to take a little more risk here than other networks. Sign up at Cake Poker.